Posted on Tue, Mar 20, 2012 : 3:43 p.m. The Ann Arbor Police Department is getting four new patrol vehicles following the City Council's approval of the purchases at Monday night's meeting. That includes two patrol vehicles from Gorno Ford for $49,420, one from Signature Ford for $27,067 and one from Shaheen Chevrolet for $26,081. 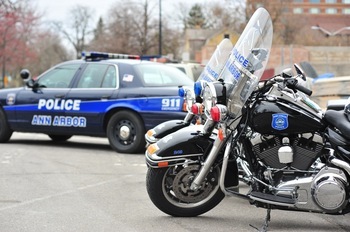 The city's labor contracts with the Ann Arbor Police Officers Association and the Ann Arbor Police Supervisors require that vehicles used by their union members will not be driven more than 80,000 miles or six years, whichever comes first. The Ann Arbor Police Department is testing out a few different models as it adds new vehicles to its fleet. Matt Kulhanek, the city's fleet and facilities manager, said the two 2013 Ford Police Interceptors — one sedan and one utility vehicle — being purchased from Gorno Ford in Woodhaven replace a patrol vehicle that will have reached the 80,000-miles limit and a police SUV that will reach its six-year age limit in the next year. The 2013 Ford Police Interceptor sedan being purchased from Signature Ford in Perry and a 2012 Chevrolet Caprice being purchased from Shaheen Chevrolet in Lansing both replace patrol vehicles that will have reached the 80,000-miles limit in the next year. The standard patrol vehicle used by the police department in recent years was the Ford Crown Victoria, which was retired last model year. Kulhanek said the police department and the city's fleet services unit are currently evaluating all pursuit-rated vehicles from the three major manufacturers, including a Dodge Charger patrol vehicle and a Chevrolet Caprice patrol car equipped with a 6-liter V-8 engine. He said there will be four other police vehicle purchases on the next council agenda. "With these purchases, we will have at least one of each configuration of the pursuit-rated vehicles from each of the major manufacturers," he said. "Once the evaluation process is completed, we will standardize our police vehicle purchases to one manufacturer." The council approved the purchases Monday night by an 8-0 vote with Council Members Jane Lumm, Carsten Hohnke and Margie Teall absent. Under a separate 8-0 vote, the council approved spending $175,175 to purchase a new 2012 Elgin Pelican series street sweeper from Bell Equipment Co. in Lake Orion. It replaces a 2001 street sweeper used by the city's field operations crews that has 6,600 hours of use. Over the last two years, the street sweeper being replaced has been to fleet service for maintenance and repairs 82 times, of which 40 percent have been for breakdowns, according to Thomas Gibbons, financial analyst for the fleet and facility unit. "The total cost of all repairs over the same time frame have exceeded $104,300," he wrote in a memo to council members. "Not only are the repairs costly but the excessive down time is crucial as there are no backup or spare sweepers in the fleet." Field operations reduced its fleet of street sweepers by one unit last year, leaving it with four mechanical Pelican series street sweepers and one vacuum street sweeper operational. The four Pelicans are used to pick up larger items and the majority of small debris. The vacuum is used as a second or "finishing" sweeper to pick up remaining debris. Wed, Mar 21, 2012 : 3:05 p.m.
Of all the city services, sweeping streets makes the most improvement to the looks of the neighborhood. If necessary we could contract trash pickup but clean streets are Great. Wed, Mar 21, 2012 : 1:18 p.m.
$175,00 for a STREET SWEEPER? On top of that you are paying someone to run it and maintain and fuel it. Why doesn't Ann Arbor just hire people to clean the streets? There are people out of work that would love the money. And you could pay them a decent salary to do the job. Wed, Mar 21, 2012 : 10:42 a.m.
Clean streets versus fire protection. I think a new fire truck would be more in order. Wed, Mar 21, 2012 : 12:48 p.m.
but a clean street is less likely to spontaneously combust. Wed, Mar 21, 2012 : 1:19 a.m.
80,000 maximum miles? Today's cars can hit twice that number. More disturbing is the union dictating the number of miles. And I agree, buy these cars locally. Wed, Mar 21, 2012 : 2:02 a.m. Wed, Mar 21, 2012 : 1:09 a.m.
We're going to buy a new street sweeper from the same company that sold us one before that broke down 82 times? Either buy it from someone else, get someone to fix it who knows what they are doing, or buy some brooms. You can pay me half of $104,000 a year and I'll keep it running. Tue, Mar 20, 2012 : 11:32 p.m.
Well, since we don't have the AAPD to staff additional cars I guess these cars will last a really long time and save the taxpayers money for lack of use. Mayor Hieftje, is there an art installation about global warming in each car? Tue, Mar 20, 2012 : 10:32 p.m. It should be MANDATED that City funds be spent within City (or County where City isn't available) limits whenever possible. I'm positive the local dealerships would have matched the price and/or they should offer a special incentive for municipalities to buy local. Tue, Mar 20, 2012 : 9:32 p.m.
Tue, Mar 20, 2012 : 8:17 p.m.
Tue, Mar 20, 2012 : 11:09 p.m. I'm not in the car business but I would be stunned to know a local dealer couldn't order the car and have it delivered. Tue, Mar 20, 2012 : 8:52 p.m.
Not all dealerships sell police vehicles, either by the dealership's choice or by manufacturer's allocation. It's not as simple as going down to Varsity and picking the color that you like, these are specialized vehicles that are not produced at the same time as their civilian cousins.